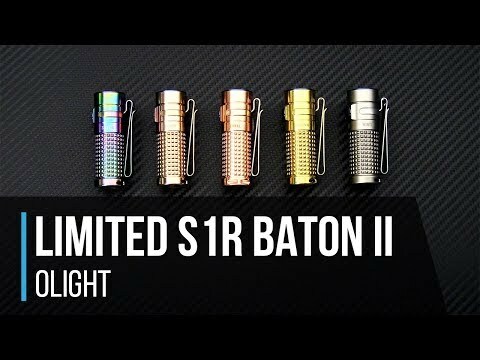 The Limited Edition Olight S1R II Baton has a Turbo mode that provides a 1000 lumen max output thanks to the single IMR16340 powered platform. It has an upgraded MCC II magnetic charging cable which attaches directly to the tail cap and plugs into any USB port. 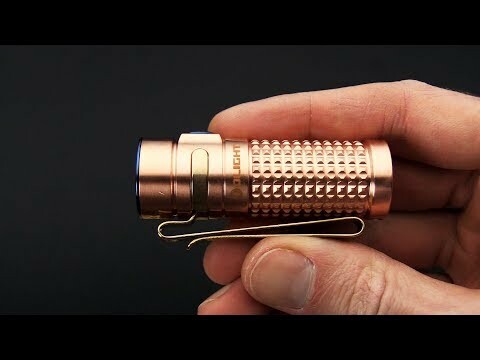 The combination of a small compact form factor and simple one button operation with lock out mode and power indicator makes this light one of our top choices for every day carry and use for all users. Includes: S1R-II Flashlight, Embroidered pouch, lanyard, magnetic charging cable, IMR16340 battery, plastic battery box and user manual. This is the Eternal model with a raw, uncoated, full copper body and 6500K Cool White LED. Body: Raw, full copper body construction with magnetic tail cap can attach to most ferrous objects for hands free use. The Version II has Small squared texture milling for enhanced grip in the hand. The removable stainless steel pocket clip can be used for either lens up or down carry in the standard configuration. The second-generation TIR optic lens pushes the beam to a new level with unmatched clarity and balanced hotspot. New on the S1R II is the three-color power indicator. When the light is on the indicator located in the center of the side switch shows the power level in three colors: Green - >60%, Yellow - between 10% and 60%, Red - Power<10%). Operation: The easy to use single power/mode switch is intuitive to operate. Just tap the switch to resume to the last mode used. While the unit is on, press and hold to cycle through the brightness levels. A quick double tap will turn the light on to the highest level regardless of what mode was last used. Three quick taps puts the light into a disorientating strobe mode. Holding the button for more than one second will enable moonlight mode, and if the button remains held the light will turn off and enter lockout mode. To exit lockout, just press and hold the button to activate moonlight mode again. Circuitry in the light gradually changes the brightness levels during mode changes and power cycles to make it easy on the operators eyes. Additionally, to maintain thermal control the light will only run at the highest lumen output for a minute and a half before lowering down to 300 Lumen output. Charging: The S1R II comes with a 750mA USB charging rate cable that connects to the tail cap magnetically. The new MCC II charger is 13% thinner than the previous MCC and compatible with all existing rechargeable flashlights and headlamps using this charging method (not compatible with R50 Pro and PL MINI).